Our clear wing nut screws (also called viking hat screws) are quick-assembly binding screws that push together to close and unscrew to remove. Available in four lengths, these wing nut screws will fasten together materials ranging from approximately 1/8” to 1-3/8”. All sizes have a 0.187” shaft diameter and a 0.537” head and wingnut diameter. Fast assembly — just push the wingnut onto the screw. Quickly and securely bind materials from approximately 1/8” to 1-3/8". For materials less than 1/8" use our ultra-short clear binding posts. 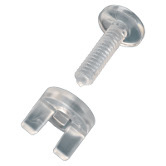 Easily unbind materials and reuse the screws by removing the wingnut. The wing-nut comes molded to the screw. Just snap it off for use.